Ridgefield High School Senior Class President Clarkin Speaks to Fellow Grads, Faculty, at Today's Graduation. Looking back on my high school career, I, like many others, stand here with conflicting emotions. When I imagined this speech, I wasn’t sure what to write. I felt overwhelmed by the multitude of attitudes that all of us have toward our four years at Ridgefield High School. A few might say that RHS was the best four years of their lives. Some might consider them the worst. But most of us fall in between these two perspectives. Keeping this variation in mind, allow me to touch on some experiences I think we’ve all shared. Regardless of how you feel, RHS has been our home for the past four years. And although reaching this finish line was not easy, there was usually someone at the High School who you were happy to talk to. That person may have been your teacher, a member of the administration, or a friend. I invite you to reflect on the positive with me and on the lessons we’ve learned. And the positive has to include failure. Because from our failures we’ve learned the most valuable lesson of all: how to lead a life of character. Every obstacle we’ve faced and negative experience we’ve had has left us better than we were before we entered RHS. We’ve grown up knowing that facing failure is an inevitable part of life. We’ve seen this message on posters in our classrooms, we’ve read famous quotes about this reality, but for many of us, RHS was the first place we truly experienced failure. Whether that failure was in the classroom, on the field, or just in failing to be excited about the day-to-day of high school life, haven’t we surely learned from it? In each moment of failure, we’ve seen others, or ourselves, become acquainted with the incredible strength it takes to turn failure into accomplishment. Our experiences at the High School have shown us that Ridgefield, sometimes dismissed as “small”, “sheltered”, and “lacking diversity” is so much more than those labels. RHS, it's perceived limitations notwithstanding, is a snapshot of the world we are about to enter-- a world in which hate speech is scrawled on bathroom doors or in libraries, and gun violence still exists. Our high school’s environment has been conducive to creating opportunities for its teachers, administrators, staff, and students to show us how to respond to atrocities and the importance of never taking anything for granted. From the National Walkout, Man’s Inhumanity to Man assembly, Names Day, and the frequent reminders we’ve received about growing up in such a lovely town, we have been inspired to make something of the opportunities we know we are fortunate to enjoy. Perhaps my favorite lesson of all, we’ve learned that we define ourselves independent of what others think, and each of our experiences has taught us the importance of confidence. Whether thatconfidence and sense of pride is displayed during spirit weeks, at sporting events, in the classroom, or on social media, our class has always had a way of making its presence known. Ridgefield High School has given us the platform to respond to adversity, to learn from failure, and to count our blessings, three lessons that we will carry with us for the rest of our lives. I know that the class of 2018 can’t help but get out there and make its mark on the world because we are prepared. 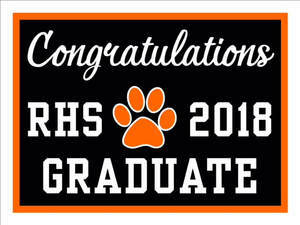 So congratulations to all, and remember, once a tiger, always a tiger!